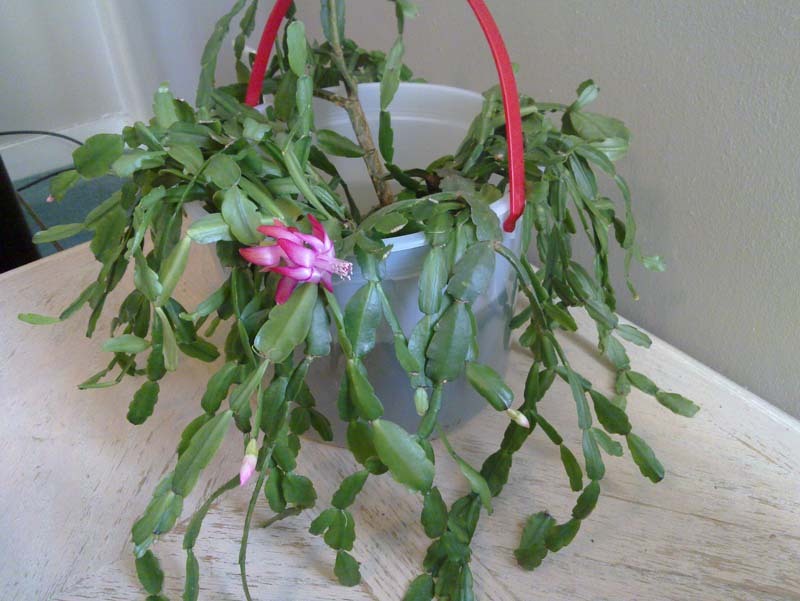 A Christmas Cactus "Child" survives! Hooray! My son Terry just sent me a photo of a thriving cactus "child" in the same bucket I put it in after the cactus crash! 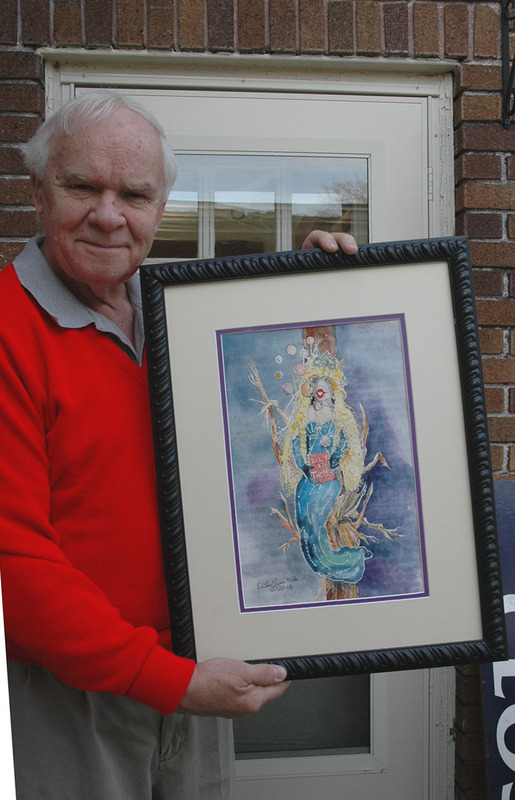 He and Dani transported it in their car when they drove back to New Orleans. I predict it will root in its water and be safely growing in dirt sometime around Easter. There are some healthy buds on many of its branches, and it is likely that it will bloom again next year. I am delighted at its recovery and congratulate Terry and Dani on their care of the "old lady cactus" survivor. We have about a dozen small starts on a table in my studio, and I am also hopeful that they will thrive. A good friend of mine gave me (for Christmas) the perfect ceramic planter for a much smaller version of this now famous cactus, and I hope to have a newer and sleeker model growing in it before summer. our web site in the "Christmas series" and the "Children's series"of prints. until......Father Time began to catch up with us, and the multiple steps became worrisome and potentially dangerous, so we moved, and are content now in our snug brick bungalow - all on one floor, with our little gallery attached. Thank you for your encouragement and support. We enjoy our small gallery, and are pleased to be able to share our painting and poetry with you. 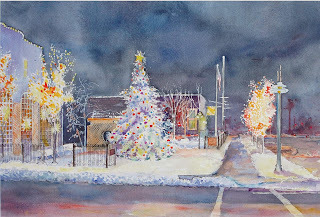 Am still working on my 2010 Christmas painting, which will be considered a New Year's card, and will be sent out soon. In the meantime, peace and joy to all of you in 2011. A warm and friendly Christmas from Culver, Indiana! This wonderful small park is located in Culver's downtown historic district - our town's post office is just behind this park and a variety of small to medium sized shops, a CVS pharmacy, offices, condos, a B & B,and other rentals, two small museums, a bustling library, a bank - across the street. 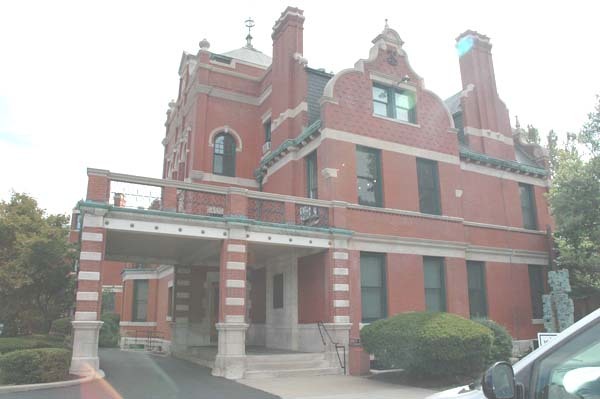 A hardware store, a florist, several good restaurants and real estate sales and rental offices are all in close proximity. 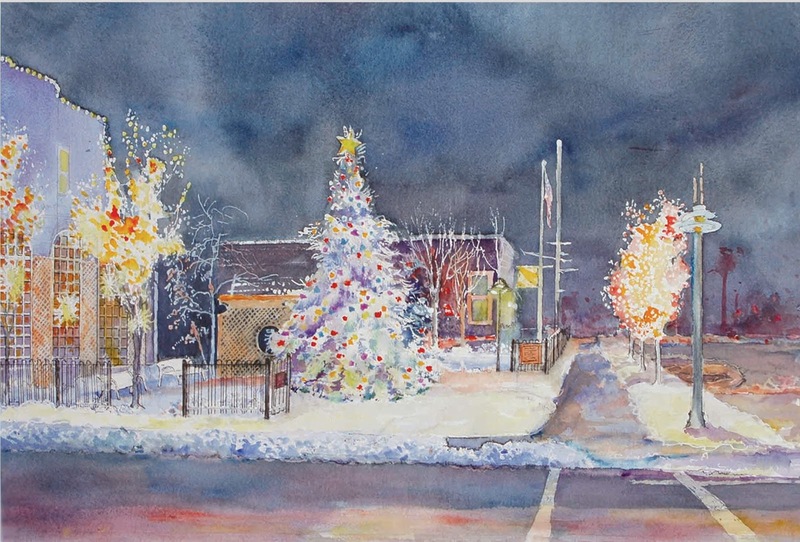 Our Painter and Poet Gallery is two and a half blocks north on this same Main Street of Culver, Indiana - a small town with a huge warm heart!! Welcome visitors! This plant - almost a century old was almost three feet across - thus trapped in our home and too large to go through any of our exterior doors !! My first reaction was shock and sadness. Then I started to giggle. "Well, I guess I won't have to worry about that cactus anymore!" My older son and his family were here visiting when this unusual event happened, and after everybody else was in bed, I sat there mulling over what to do with the "remains". Decided the damage too drastic for repotting, I settled on hauling out three large empty plastic ice cream "buckets", and cut the intact branches apart, and placed them root side first and down into water. Ward put some bricks on top of the cactus table to stabilize the weight, and I'm keeping them watered and in a south window, and attempting to get some new starts going. If any of you would like to have a cutting off this plant, just stop in with your small water container, and we'll give you a piece of that wonderful old plant! But in this frigid season, you'll have to keep the fragile branch warm so we'll need to bundle it up for you! 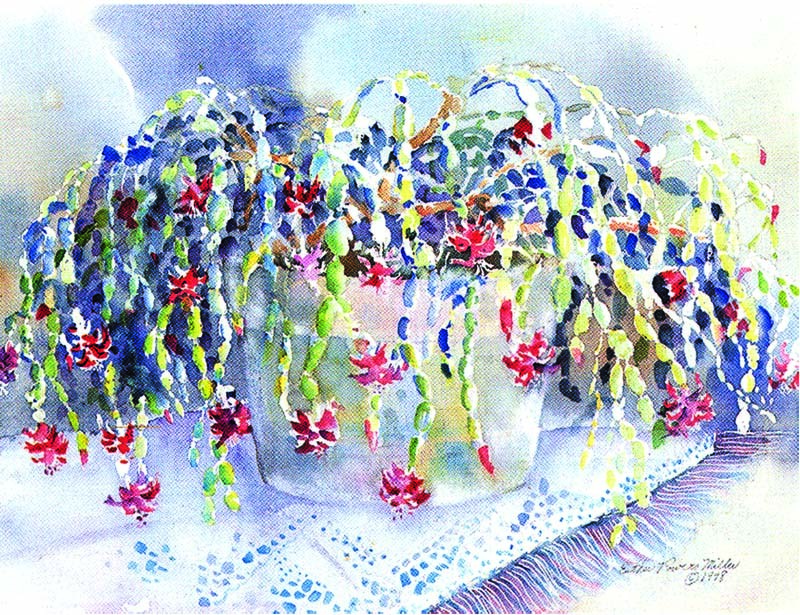 Here's a copy of my painting of Mother's Christmas Cactus. Prints and cards of this also available in our little shop and on our web site. Our pleasant memories of this plant live on, and we wish you a merry, merry Christmas with happiness that will extend throughout the coming new year! We welcome your emails and comments. Winter hours: 10 till 5 on Fridays and Saturdays, and whenever the open sign is out. Or call for an appointment 574-842-8888. A NEW START! November is behind us. large kidney stone, and endured 2 surgeries for treatment. Everything else went on hold while we worked for his recovery. He is now almost back to normal, and we are most grateful - to his excellent doctor, and the concern and generous help from family and kind friends. Cook Book Mode has been my computer life for the last several weeks, and 22 new spiffy spiral bound cook books - "COOKING, PAINTING & POETRY - from Painter and Poet" are piled on our dining room table. Some of these have been pre-ordered, and the master file for reprinting them is safe on our trusty Mac, and on backup files. For background on these books - Four years ago, I composed a family cook book preserving only our very favorite recipes for family and close friends - a project I very much wanted to complete. Since then, a few more exceptional recipes have expanded our selective list of favorites , and these are also included in this new book. 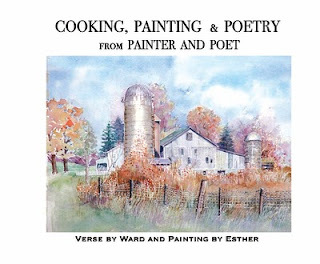 This cook book centers around three of Ward's and my favorite activities - cooking (and eating), painting, and poetry, so here you have it - "COOKING, PAINTING & POETRY from Painter and Poet." Contents of this book: over 100 favorite recipes - breads, appetizers, desserts, main dishes, salads, soups and sandwiches, veggies, and turkey dinner basics; almost 90 full color illustrations of Esther's most popular watercolor prints and note cards; and a nice sampling of Ward's poetry. Along with the recipes, the poems and the watercolor illustrations are indexed, and some of the collectors are named. Where possible, we give credit to the generous people who shared their super recipes with us. This "family" collection is dedicated to our seven children and our grandchildren (+ 2 "grands" for Ward), and the cover image is "Uncle John's Barn", named to honor my dad, John Henry Scobie, who was a fantastic father and a true "gentle man". We've kept our cook book pricing as low as possible, but cost escalated because of all the full color print illustrations. We're holding the introductory offer price at $49.00 - boxed, autographed if you wish, and including a note card (possibly one of those included in the book's illustrations). When we sell out of our initial printing, orders will be taken, and the price then will be $59.00. It's fun communicating with you again, and I leave to go back into the living room and into "Christmas Tree Decorating Mode." P. S. To order our new cook book, call us. Cook book not yet added to our web site. 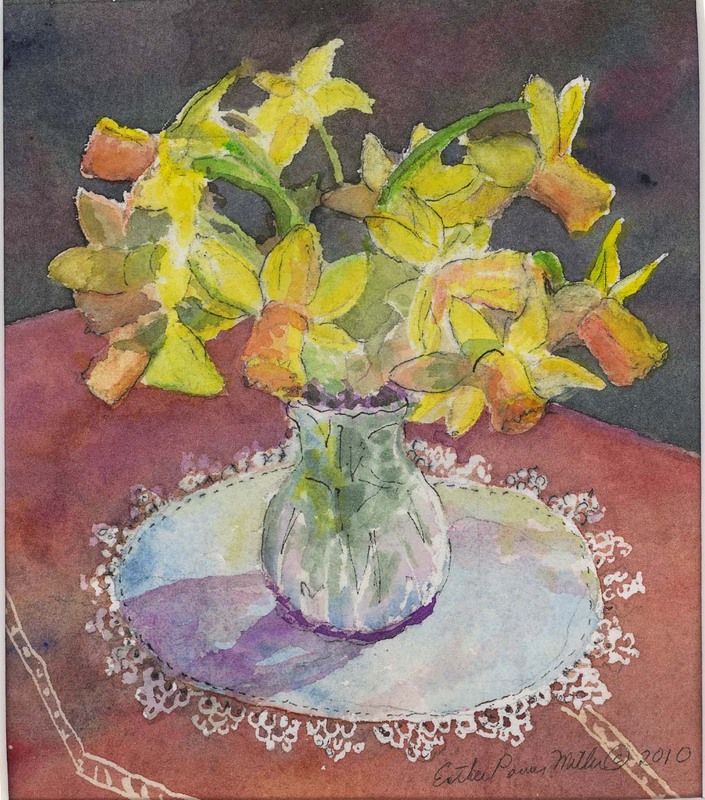 Wide selection of prints and many note cards available on our web site. WOW Look at these huge rock formations! We were overwhelmed by the majestic beauty. 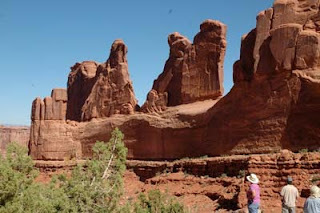 What an awesome sight - our first view of Utah's Arches National Park. We spent several hours driving through a small portion of this huge park, and proceeded on into Colorado, and through more gorgeous mountains, some covered with dark evergreens and others sprinkled with trees frosted in golden fall colors - an irresistible source of wonderful inspiration for a great water media artist, like Stephen Quiller. (and a great temptation to an enthusiastic lesser painter, like me). 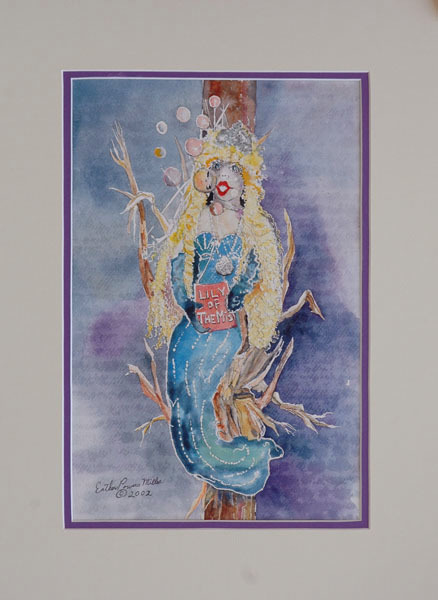 And what a grand thrill to finally arrive at the Quiller Gallery in Creede, Colorado! Such terrific paintings! I have admired his work for years, and this was such a very special treat - and I'm most grateful to Ward for navigating all the elevations and curves in this tough by gorgeous terrain. We were fortunate to be able to visit Quiller Gallery - scheduled to close for the season only several days after our arrival. 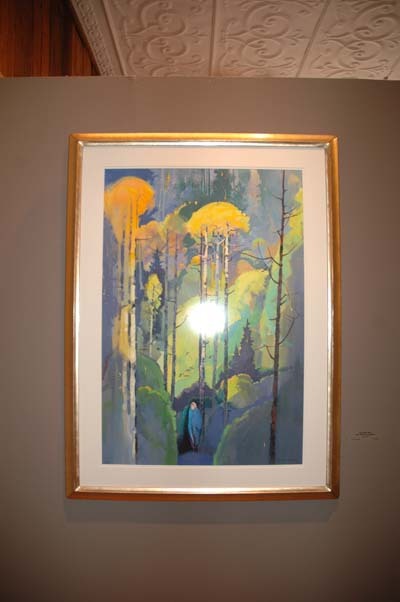 Burdette Knous was a delightful hostess and Ward and I were thrilled to view so many of Stephen Quiller's marvelous paintings. My absolute favorite is pictured here. It is called "Sojourn with Red Wing Blackbirds" and my photo does not do it justice but does gives you an idea of what it looks like. Check www.quillergallery.com to learn more about him and to view this painting and many others. Studio Update: All of this gadding around has been stimulating, but also exhausting, and I'll admit to sleeping some long hours to try to regain my energy. 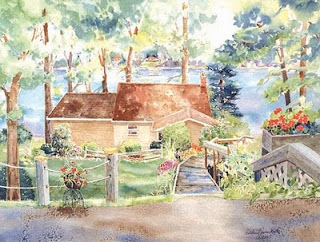 Am now putting the final finishing touches on my large watercolor of a Lake Maxinkuckee Home. So will sign off for now and get busy on it. We've been home now long enough to have mail opened and laundry almost finished. Had a delightful journey to Utah where we enjoyed the warm hospitality of Ward's daughter Michelle, her husband Justin and their wonderful family - Elizabeth, Amy, Allison and Daniel. My two+ years there is a distant but very pleasant memory. I remember appreciating my freshman year where I had the opportunity to sample many art forms. Lee told us this format was abandoned for many years with a change for freshman to a simpler study program without the variety I enjoyed. The pendulum has swung back and today's first year students are enjoying the introduction to a wider variety of art forms, much like those that I appreciated long ago. Now students also are introduced to many computer applications - so many innovations with technology! I'm thrilled and challenged to be able to work with some of this wonderful new STUFF! 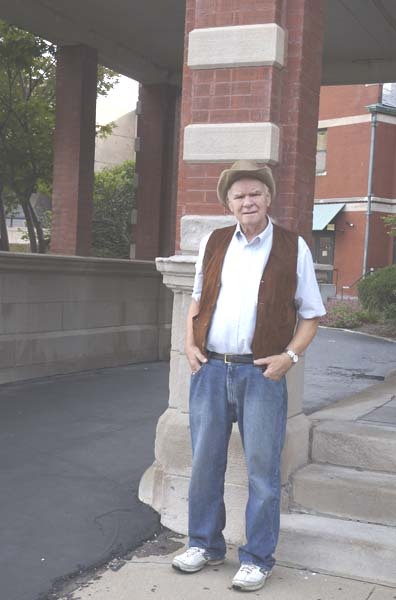 Will post this with several photos - a lop-sided view of Vanderslice Hall and one with a typical pose of Ward in front of it - (Take a look at the cowboy hat and the suede vest - quite the dude!). Am having a glitch downloading some of our photos from the camera to our computer, and hope we get this solved. 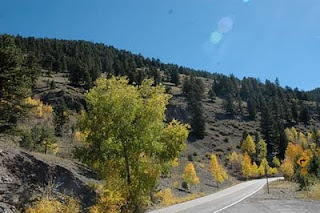 Hopefully, I will share more trip details including a wonderful visit to Stephen Quiller's Gallery in the mountains of southern Colorado. Ill sign off for now and be back in a few days with a photo of my latest large watercolor. 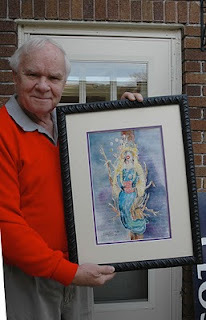 Check out our web site - www.painterandpoet.com. Culver Boys and Girls Club Auction! Culver's upcoming Boys and Girls Club fund raiser is almost two weeks away. And last week has found Ward and me preparing our contribution to this auction. We are donating this special signed and numbered print of Chief Menominee, a kind and wise man who in the early 1800's was driven from his tribal lands near Plymouth. 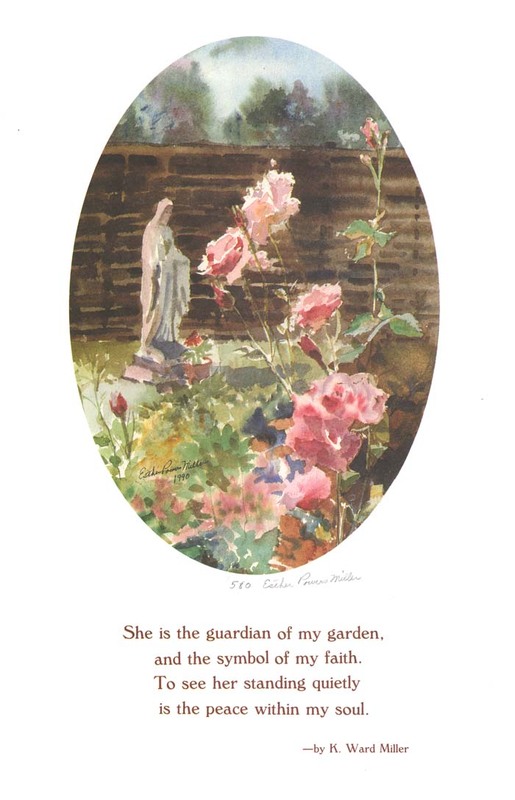 Ward wrote the eloquent and sensitive poem included with this print, and he hand cut the mat with its three openings, and is finishing the framing. 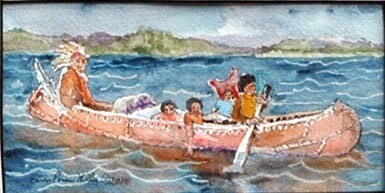 I painted the small original watercolor, an Indian family in a birch bark canoe - note the squaw doing the work- paddling, while the grizzly old father rests and supervises from the stern of the boat. The three Indian children are clustered close to Mom - with the papoose secure on her board, the little brave dangling his arm in the lake, and the little princess timidly observing. 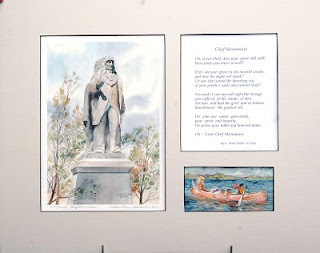 This composite - print, poem and original painting of Chief Menominee is our donation to this upcoming Boys and Girls Club Silent Auction to be held at 6:30 P M on Friday, June 18 at Lay Dining Center located on Culver Academies Campus. This auction is the major fund raiser for a terrific local group that provides support for our most important emerging asset - the youth of our community! Try to attend - not only will you help our local school kids, you will have a wonderful evening of conviviality and the opportunity to bid on many interesting items - from large to small. Tickets may be purchased at the door - $40 each or two for $75.00. Complimentary food buffet and drinks. 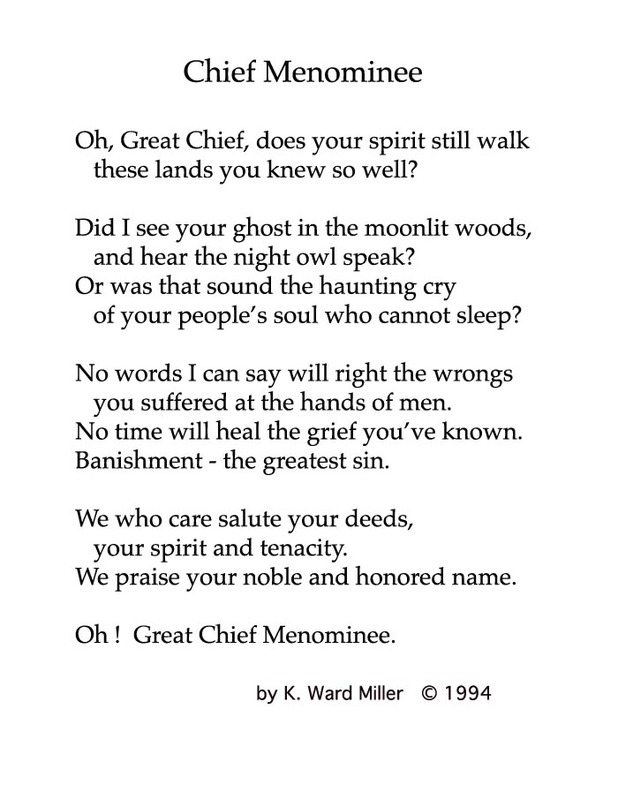 And on our web site, we offer standard versions of this print with Ward's poem, and my image of Chief Menominee. 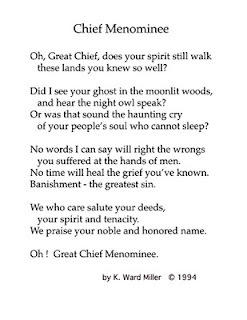 Click here: www.painterandpoet.com and go to prints, then to the Plymouth series to get details and order the standard Chief Menominee print. We are also giving a framed copy of our latest print, Broad Stripes and Bright Stars, to this auction. 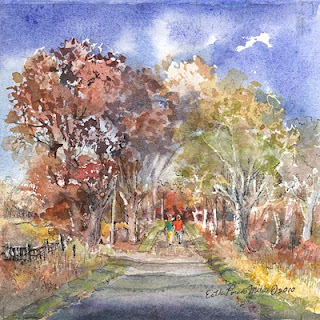 Copies of this print are also available on our web site (listed in the paragraph above) - and in the Culver Area Series of prints. 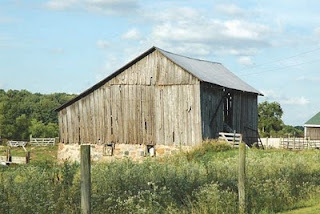 Earlier this week, Ward and I have enjoyed a few brief country rides and have returned with some interesting photos, including an old tractor and several barns, one with a Notre Dame design in the roof shingles. I'm imagining myself painting a specific old barn with that old tractor in the foreground. The idea is there, and when it emerges as a watercolor, I'll post it here for you to enjoy and/or buy! Culver Academies' graduation is this weekend, and we've been busy filling orders and waiting on customers. We hope the weather stays nice for graduation. Painter and Poet Gallery Hours: Thursday, Friday and Saturday 10 till 5. And by appointment or chance. We are open lots of other times - call to check. Earlier this evening, Ward and I were sitting on our little patio, enjoying our fresh strawberries and watching Culver's version of "the world" ambling by. So pleasant - enjoying the new blooms of my pampered delphiniums, and the sounds of birds. We could get a glimpse of the street and sidewalk in front of our house, but we were not in clear view - and sort of spying on what was happening. It was busy, busy here over this last weekend - with Culver Academies' reunion celebrations. Lots of customers in our little gallery, and fun connecting again with some old friends, and enjoying a nice visit with 2 friends and classmates of my children who came to celebrate a 40th anniversary of graduation from THE ACADEMY - as we natives refer to it. My son Terry came last year for his 40th. Wow - how time races by! Earlier this week, my helpful hubby found a large cardboard appliance box and brought it home to use in making a light box. I've been thinking about this (I hear him groaning), but this is not going to be a huge project like THE EASEL/DESK which you may remember from earlier blogs. The reason for the light box, is to control the lighting to help me to take better photos of still life setups. Over the years we have acquired or inherited, or been given, lots of "stuff" which I enjoy looking at - including my old doll, Mary Ann, who was also my mother's doll, s0 Mary Ann is probably almost 110 years old. I am itching to paint a small watercolor of her and that's just for starters. There are lots more old relics around here - including us. So keep reading these blogs - hard telling what might appear. 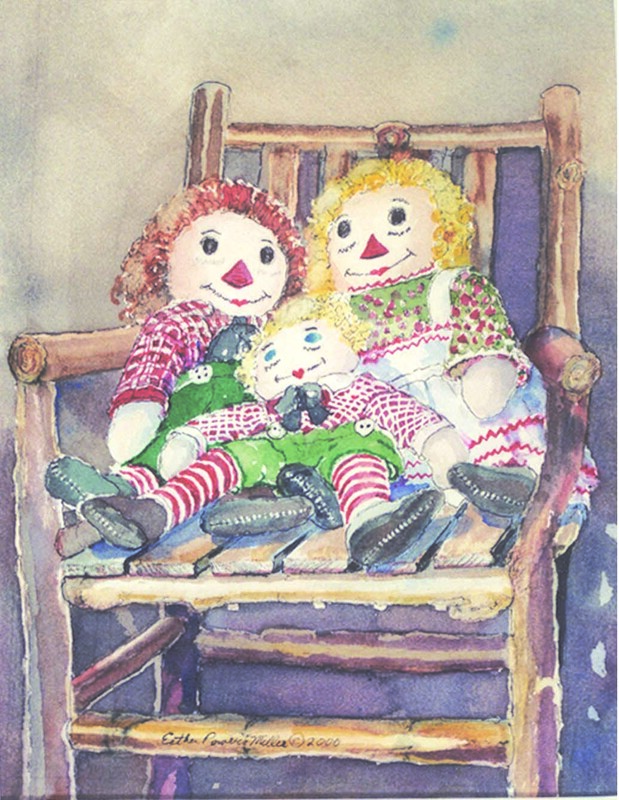 Remember to check out our web site, www.painterandpoet.com where you can find info on us, our prints, and a relatively new section listing some of our original watercolors. It's a wonderful and "blooming" season! Such a cheerful time of year and our small perennial flower garden is looking great! Ward planted a new rose bush. I've transplanted some purple flowers that will bloom all summer, and I'll be taking photos and doing some paintings of them. When I post a photo and a painting, I'm hoping somebody will identify the flower! My younger daughter, Jennifer, will be bringing me a new rose bush next weekend - my Mother's Day gift from her. I have a spot saved for it. Last week I took some closeups of a clump of ruffled lavender tulips that she planted for me 10 years ago when Ward first prepared our perennial bed. When she was a young girl, she dug up some daisies and planted them- all by herself. Never did know exactly where she found them. Flowers make great gifts! Several weeks ago, we were delighted when J.D. and Linda Russell, old but young friends (25 years our junior) called and came to visit. 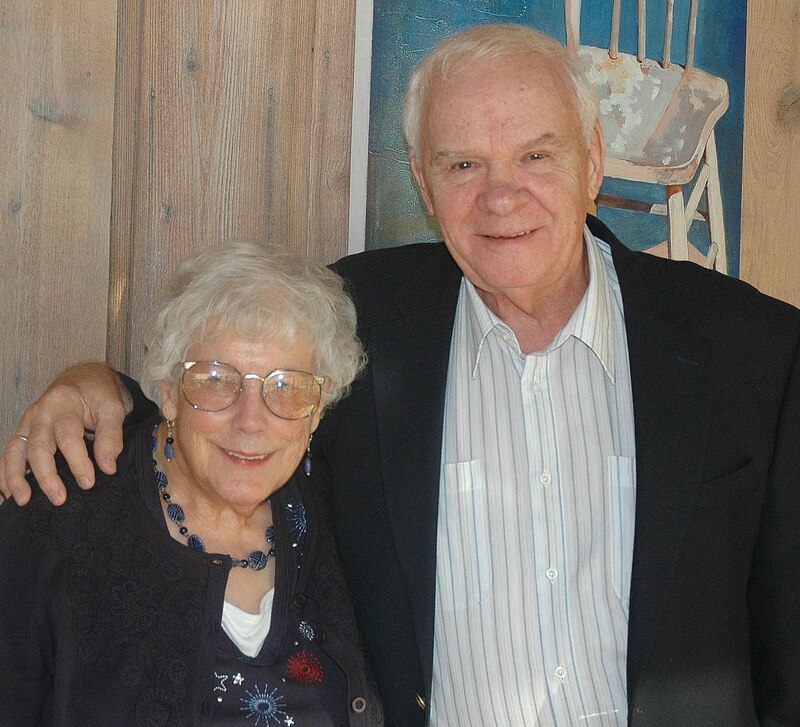 We enjoyed a good lunch at Cafe Max, and enjoyed reminiscing about our days as real estate appraisers. She took our photo and sent us a copy which I'm posting here. We've been using a photo taken about a decade ago, and I think this new one better represents us now. We are standing in front of the fireplace in our living room, and you can see a bit of our home. 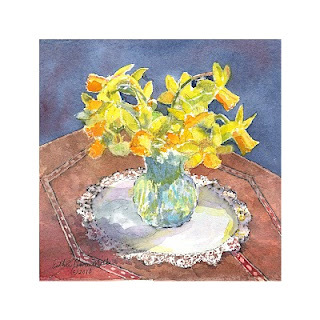 A few weeks ago, I posted a very similar painting of daffodils, and wanted to try it with a different approach. So, here it is - Sunny Daffodils, a 6" x 6" watercolor surrounded by an off white archival mat with a narrow gold line next to the painting. This painting will be sold to the first person to contact us with secure payment of its purchase price of $98.00 (including shipping within the U S). This offer will expire on May 18 (about 10 days from now). To purchase this painting Email us at info@painterandpoet.com or call Esther at 574-842-8888. Pay/Pal and other credit cards and money orders accepted. If desired, we can send you a PayPal invoice. Remember, paintings look different on different computer monitors. If you purchase this painting and are not fully satisfied, you may pack it carefully and return to us at your expense and we will refund your full purchase price. No questions asked. 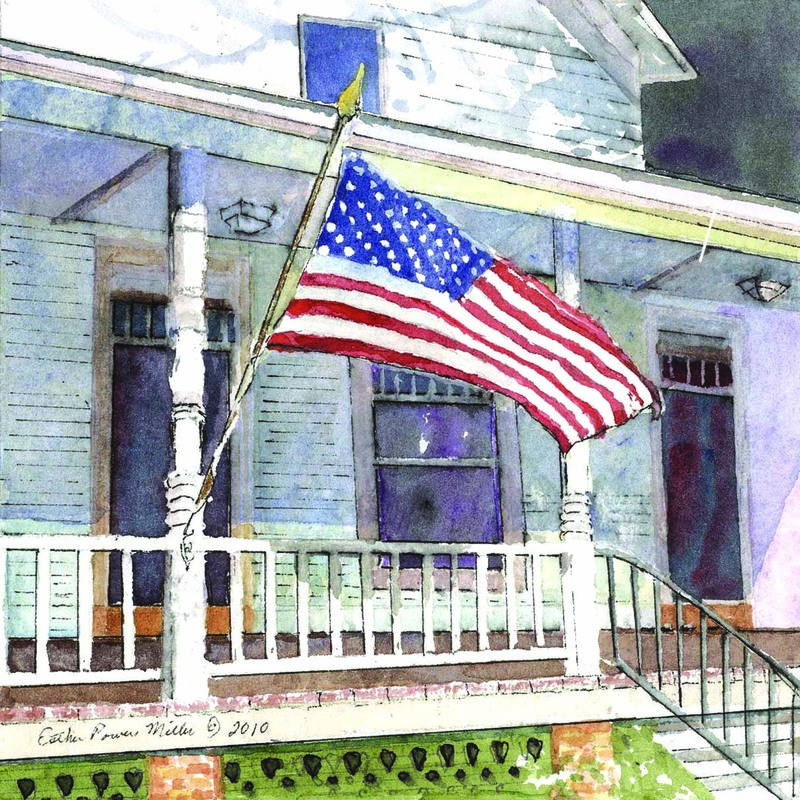 The new flag/porch print (from an original sold here about a month ago) is called Broad Stripes and Bright Stars. 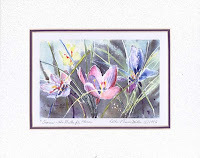 Matted and unmatted prints will be listed on our web site - www.painterandpoet.com within a few days. Image size is 6" x 6", the same size as the original. Watch for it. Am working on 2 more small 6" x 6"'s, and also making good progress on the painting of a large watercolor of a wonderful lake cottage. While painting, I usually listen to books on CD, and am more than half way through Team of Rivals by Doris Kearns Goodwin about Abraham Lincoln - 36 CD's - enough to keep me anchored to my easel. Biography type books like this work best for "painting/listening" - no complicated plot. Painter and Poet Gallery Hours: Friday and Saturday 10 till 5. Sunday afternoon 12-4. And by appointment or chance. Culver info? Go to www.maxinkuckee.com (You can check the current temperature on this site, and along with other good community info, you can check out activities at the Culver Public Library - mentioned above). Ward and I are blessed with a total of fourteen grandchildren and great grandchildren, and it is my hope to complete a special watercolor for each of them. About a month ago, I posted a painting of a wooded scene in Germany - which we shipped to my oldest grandson Michael. 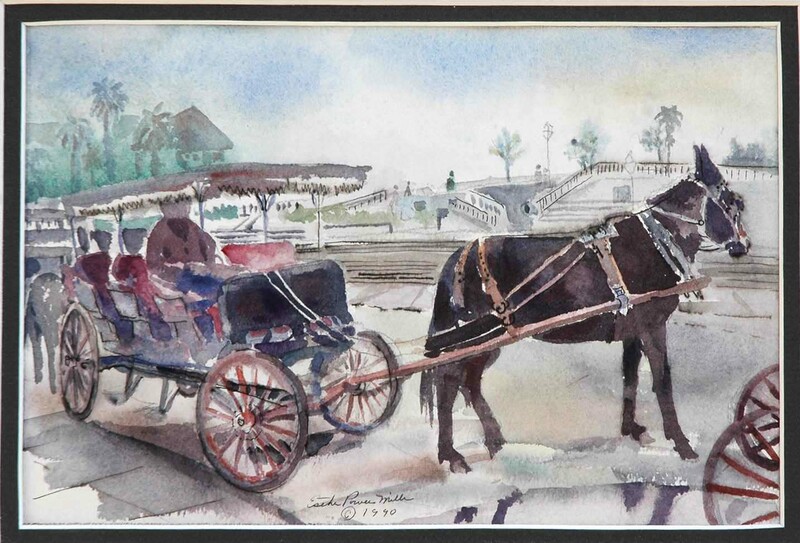 Melanie is my third grandchild, and today, we are sending her the original watercolor shown above - New Orleans Buggy Ride for Melanie - as a gift for her 25th birthday. A native of New Orleans, it is still her home. 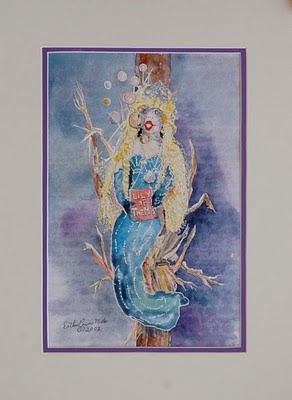 About 20 years ago, at the beginning of our Painter and Poet journey, we participated in some New Orleans area art shows and I had fun painting rather kooky watercolors of N O scenes. This original is from that early period. My own birthday was several days ago, and I'm still reeling from the pleasures of that day - thank you all. Cards propped on the side table in our dining room - I'm enjoying re-reading them and hoping to take a photo of the friendly daisies sent by my older daughter, Suzy - maybe they will be in a watercolor someday. Special cookies, more wonderful daffodils, long heart warming phone calls, and an upcoming shopping trip to South Bend with my buddy, Darlene. Plus several great necklaces to adorn my old neck! Wow! I feel so very lucky and so young that I can't believe I'm such a relic. 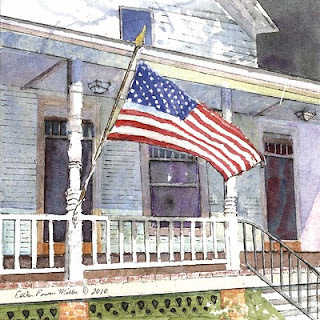 Am happy to report that the original I posted several days ago - a flag on an old fashioned porch - has been sold. We will soon have prints available, and they will be posted on our web site and in our Culver gallery. Have spent the last several days assembling mat colors and picking frames for prints and originals, replenishing the supply of note cards, doing some updating on our mailing list, and getting Uncle Sam paid. Yesterday I struggled scanning and working on the new prints of Broad Stripes and Bright Stars, introduced in our blog several days ago. 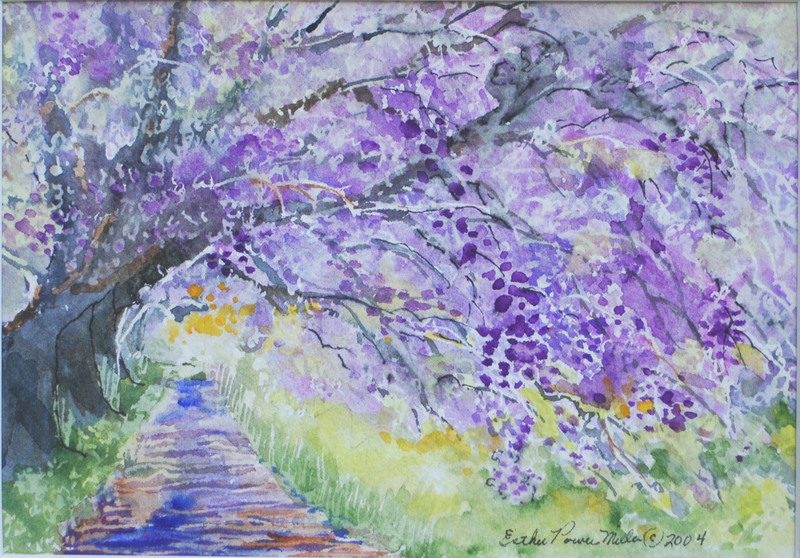 Spring is truly here and Ward and I have been driving around, admiring flowering bushes and trees. 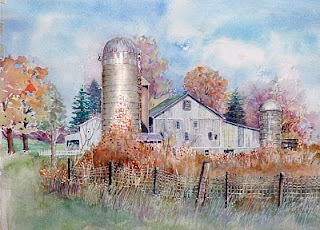 I've promised him that I'll soon paint an old weathered barn and silo to complete our composite creation - his poem with my accompanying watercolor. Today we spied a splendidly dilapidated old silo on Olive Trail just south of Plymouth. This "old silo scene" is percolating in my brain and I'll soon get rolling on it. Now I hope to take more photos of Gignilliat Hall in full spring regalia - I have good building details in skeletal photos taken last fall. Am excited about this project. The new easel/desk is terrific! Snow is off the ground, ice is off the lake, and we have an extra hour of daylight in the evening. And I feel like celebrating! The monster "easel in a box" is now in use and is even more convenient and comfortable than I had hoped. I'm delighted. 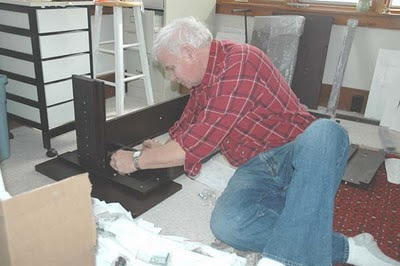 One picture shows Ward working to assemble it, and the second shows the finished desk after Ward and Beth Wilkins completed the awesome task. When I am painting a watercolor, I often use special watercolor pencils for accents and details. Note the two containers of those pencils, and another heavy glass filled with many of my brushes. The light clamped to my easel/desk is color balanced so that its light simulates daylight - I am a night owl and sometimes go on a painting rampage until the wee hours of the morning. To give you a better opportunity to purchase available original watercolors, we are adding a new section to our web site. Paintings described here will either be auctioned on EBay or added to a special section of our web site. When posted on our web site, each original will be offered at a fixed price and the first qualified purchaser will be the proud new owner! 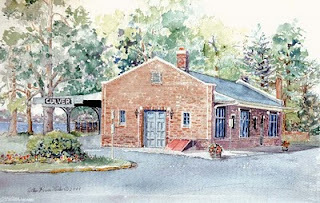 My watercolor of Culveer's Vandalia Train Station is the first original to be offered on the "originals" section of our web site: www.painterandpoet.com Its image has been on several earlier blogs so it's likely that you will remember it. You can get an idea of the scale from the photo of me holding the framed painting. This picture was taken on our side deck - the door behind me is the outside entry into my little studio, and I'm facing toward the entry to our Painter and Poet Gallery. In order to buy an original from our web site, you will need to either call me at 574 842 8888 or email us - info@painterandpoet.com - to arrange for your purchase. We can accept Visa, Mastercard or Discover. If you want to use paypal, we will be happy to send you a paypal invoice. Indiana residents will be charged 7% state sales tax. Free insured shipping within the continental U S, and additional charges for shipping to other locations. Uncle Henry's Barn SOLD - Culver Train Station on the track! 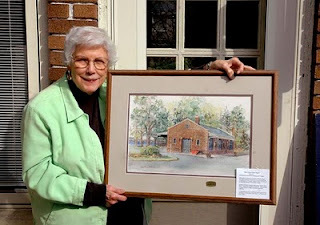 Within a few days, I'll be posting a longer blog, and the custom framed original of Culver's Vandalia Train Station will be featured for sale. But today, we will try to reorganize my studio so I can get back to a routine of alternating between producing smaller paintings in our little gallery and concentrating on my larger commissioned watercolors in my studio away from distractions. 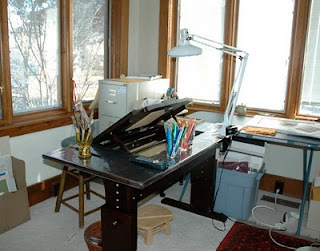 I just looked and that snazzy "drafting table/easel" is still there, beautifully assembled!! Thank you again, Ward and Beth! Tis mid March and days are warmer and sunnier. I've been out walking with Maxwell (my walker) so I can speed along the sidewalk pretending I'm a middle-ager. Culver's sidewalks are much improved over former years, but there are still some unexpected cracks and bumps. Using this walker, I can relax and enjoy the sights, and the basket is handy for small purchases. Very enjoyable. Ward and I like driving along country roads and we usually take our camera. Today's feature is painted using the above reference photo we took late last summer. 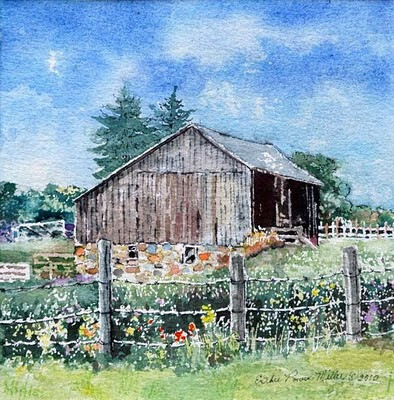 I am posting that photo and the finished painting, which is called "Uncle Henry's Barn." 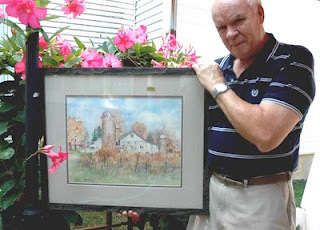 My father's name was John Henry Scobie so this barn painting is sort of named after him. This watercolor is 6" x 6". Including a two inch wide light gray alpha mat, the overall size is 10" x 10." 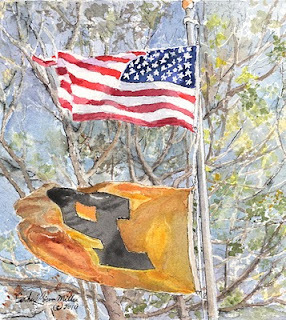 The matted print will be placed on a foam core backing, enclosed in a clear plastic envelope and carefully packaged for free shipment inside the U S. Inquire about international shipping costs outside the U S.
This painting will be sold to the first person to contact us with secure payment of its purchase price of $79.00 (including shipping). To purchase this painting Email us at info@painterandpoet.com or call Esther at 574-842-8888. PayPal and other credit cards and money orders accepted. If desired, we can send you a paypal invoice. THE EASEL .... a huge challenge! I was both pleased and disappointed when this thing arrived. I assumed (and you all know the inherent risk) it would be delivered assembled and ready for me to sit down and begin painting. Wrong! All the miscellaneous parts -a pile of (mostly labeled) nuts, bolts, boards, metal pieces, etc. and confusing diagrams! Then we noticed - "Made in China" - Well, Ward with his careful skill and determination tackled the tough job, and made a lot of progress. Then a good friend of ours, Beth Wilkins, an amazing lady, volunteered to help him conquer this monster desk. They worked together and now we have something that miraculously looks almost like the sleek vision in the catalog. Thank you, Beth. We'll post pictures in our next blog. 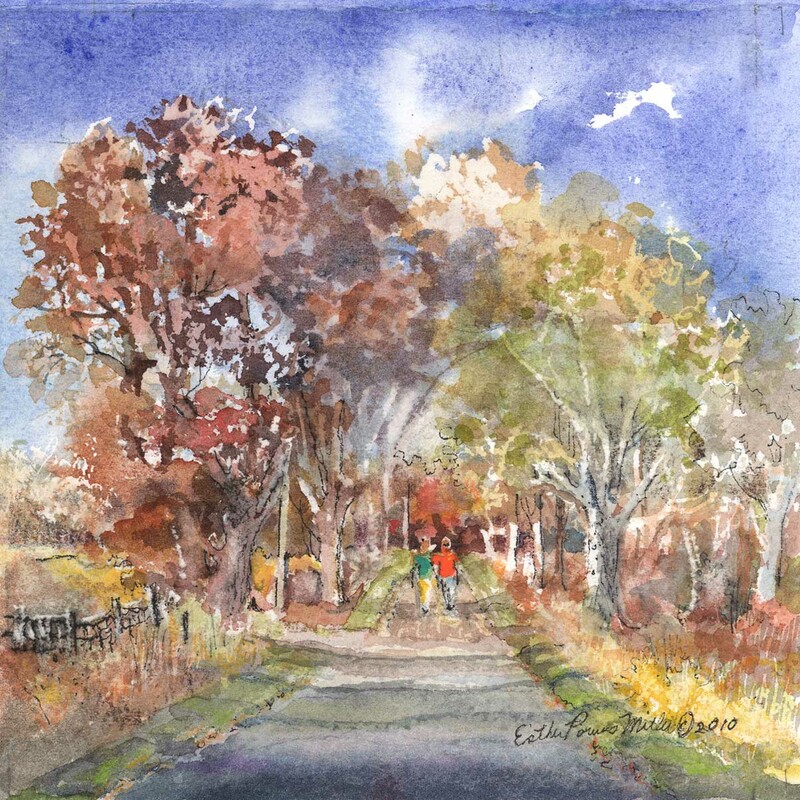 Currently, I'm working on another country scene, also 6" x 6" which features two large oak trees and a country road. This is fun, and I'm happy with the way it is progressing. It's on my little painting table in our gallery. Remember, you are welcome to visit and watch me paint. 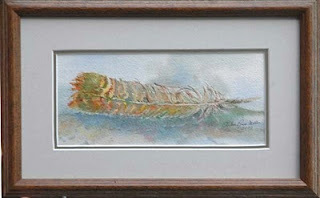 Better check first to be sure that we are here. .
Esther's original watercolor Feather is custom framed and ready to hang! The image is 8" wide and 3.5" tall. Size including the mat is 11" x 6.5". Top mat is a soft light gray, with a darker gray mat beneath. The brown wood custom frame is a little lighter than it looks here. Special "Tru -Vue" glass helps protect the watercolor from fading. And the matting is Conservation Grade - Museum Quality. 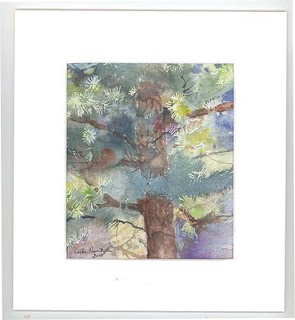 A signed certificate of authenticity is on the back of this framed original watercolor. 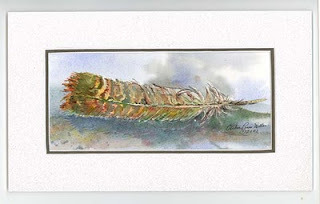 Feather is on Ebay. Click here to find this item on ebay. We are preparing to upgrade our operating system - and I'm busy backing everything up before the big event! We'll also have My Book added - this is an external hard drive that will automatically backup very frequently. Wow! Maybe I could fool you into thinking that I know what is going on - not true! I understand the general process and am grateful for expert help. Have been having fun with more of the small originals, and will post another as soon as it is finished. And I now have a small drawing table in the gallery, so I can work on some of the little paintings there - and as you come in to visit, you can see them evolve from a drawing or photograph, with interpretations and changes from Esther's brain into her fingers and then down on a piece of blank white watercolor paper. The idea, the changes, the drawing, the doodling on scrap paper to test colors and contrast, saving pristine white areas, and finally painting. Then probably some changes - scrub outs, accents, touches of pen and ink. It's almost like carving on a flat piece of paper.